Exploration is the theme of Grade 10. It builds on the foundational skills of Grade 9 by encouraging students to become more confident in taking risks scholastically as they explore a variety of academic disciplines and interests and discover their passions and strengths. A wide selection of electives are available to provide a basis for advanced study in the senior grades and a preview of more specialized areas of study. Cross-curricular themes are established to help students scaffold their knowledge by providing a context of key ideas that transcend subject boundaries. The Grade 10 curriculum has optional units to further expand the student experience. Integrated into the academic timetable, are learning outcomes associated with Planning 10 designed to help students in a wide range of areas from university planning to improving organizational skills in the classroom and beyond through lectures, discussions, and contact with academic advisors. Health and career education as well as financial literacy form important strands of this coursework. Our aim throughout is to enable students to develop life skills, become self-directed, set goals, make thoughtful decisions, and take control of their personal planning. *If a student is lacks background in the languages offered, he/she may take a second elective course instead. Learn the basics of one of the world's most popular programming languages which is used by software engineers, analysts, data scientists, and machine learning engineers alike. Python is a general-purpose, versatile and modern programming language. It's great as a first language because it is concise and easy to read. It is used for everything from web development to software development and scientific applications. In this course students will use Python for applications such as: controlling a Nao robot and using the GPIO pins on a Rasperry Pi computer to interface with electronic components like LEDs, Sensors, Lasers, and Relays. This is very much a hands-on, project-based course where, upon completion of this course, students should have the confidence and knowhow to move into any aspect of programming that they desire. The course material matches the prescribed learning outcomes for Chemistry 11 prepared by the provincial government and often expands into additional areas of interest including the behaviour of gases. Students may be required to participate in national chemistry competitions such as the Avogadro exam. A solid understanding of this course helps students who study biology, medicine, physics or engineering. The AP option moves at a faster pace to allow for extra units such as redox chemistry to be included in order to allow time for AP material in grade 12. Chemistry 11 is a survey course designed to provide a strong foundation for post-secondary science. The material covered in Grades 9 and 10 is thoroughly reviewed and followed by an intense study of stoichiometry. The fundamentals of organic chemistry are introduced in preparation for further studies at the university level. A unit on solution chemistry provides the basis for topics covered in Chemistry 12. To succeed in this course, students must be comfortable with algebra and have a firm grasp of the chemistry concepts taught in previous grades. English Language Enrichment is not available as a course in 2018-19; if needed, private tuition ca be arranged for students. English 10 students will read independently as well as assigned nonfiction, novels, short fiction, verse, and Shakespeare. Students will write approximately once a week in a variety of different styles, with particular attention to the expository essay as well as the comparison synthesis and personal reflective essays. Grammar and vocabulary studies will become part of the students’ writing process. Students will speak informally and formally, at times from memory, at times with interpretive emotion. Grade 10 climaxes with the four week genre studies unit, when students are reassigned into specialized classes to study such esoteric topics as the romance novel, Ian Fleming, debate, children’s literature, or photojournalism. All Grade 10 students cover the biology and chemistry units in half the year with one specialist teacher and the physics and earth science topics in the remaining half of the year with another specialist teacher. Many of the topics are integrated through fieldwork studies at nearby locations such as the estuary, beach and Mill Stream salmon run. An inquiry based, problem solving approach is encouraged wherever possible and students are introduced to the empirical nature of science by collecting and analysing their own data. In conjunction with the mathematics department, specific IT objectives are reached by having students handle and present data they have obtained through observation and measurement. The biology unit covers an introduction to ecosystems and the factors that determine the sustainability of natural environments. Topics such as food chains, pyramids of biomass, succession and keystone species are investigated with particular reference to the estuarine environment. Students visit the Bamfield Marine Research Station on the West coast of the island for a 3 day field trip which involves a variety of lab and beach activities designed to complement and enhance the curriculum. In chemistry, different types of chemical reactions are examined and described in terms of word and symbol equations. Isotopes and their importance in dating materials is described. Radioactivity of various kinds is described and related to their common sources. Problems associated with radioactivity are discussed and linked to the development of atomic weapons, cancer and atomic power. Motion is a major topic in physics with both uniform motion and acceleration described in terms of Newton’s Laws and simple equations. The course concludes with a consideration of energy transfer in natural systems, particularly weather and the movements of wind and water on a global scale. Tectonic plate theory, volcanism and seismic forces are also studied in this earth and space science section. Designed for students who have had previous French instruction, this course fulfills the BC prescribed French learning outcomes. Listening, speaking and writing skills are emphasized, alongside a sound grammatical understanding. French 10 is a continuation of French 9, which is a prerequisite for this course. It offers a natural progression of the scope and sequence of the French language. Students will be exposed to French in an engaging way through the storytelling method which will facilitate the genuine acquisition of the language. A continuation of Spanish 9, this is a second-year course. This course will expose the students to the diverse and exciting Spanish speaking world. As the year progresses, the majority of the class will be conducted in Spanish. The students will be able to discuss topics relating to school, home, food and eating. The students will also learn to describe events in the present and the past. Listening, speaking and writing skills are emphasised, coupled with a sound grammatical understanding. This course places special emphasis on speaking skills in everyday situations. There is a very strong cultural component to the class where the students will learn about various cultural traditions from the Spanish speaking world. An in-depth look at Latin America will take place through presentations on various aspects of its culture and history. Students will be exposed to Spanish in an engaging way through the storytelling method which will facilitate the genuine acquisition of the language. The emphasis in Mandarin Chinese 10 is on the communicative approach in which students are encouraged to convey meaning and knowledge, primarily orally but also in written form. The confidence to “take risks” is a hallmark of this instructional philosophy and a variety of methods are used to develop the necessary ease with this learning environment. The small student to teacher ratio is a critical factor as is the level of teacher expertise. Typically, students will be expected to describe or narrate, with some supporting detail, events, situations, or experiences. They are encouraged to exchange opinions on topics of interest, apply idiomatic expressions with some fluency and interact with increased independence in familiar life situations. Students also acquire knowledge by having them view, listen to, and read creative works, and respond to them in various ways. Cultural awareness is increased by having students identify customs and traditions from various cultures in the Canadian mosaic, and compare them with those of Chinese cultures. This class will expose the students to the diverse and exciting Spanish-speaking world. The majority of instruction will be conducted in Spanish. There will be a heavy emphasis on listening and speaking. New material and new concepts will be introduced through a thematic approach. Students will be able to discuss topics relating to school, after-school activities, celebrations, travel, eating, shopping and getting around town. The students will also learn to describe events in the present and the future. There is a very strong cultural component to the class where the students will learn about various cultural traditions from the Spanish-speaking world. An in-depth look at Mexico will take place through presentations on various aspects of the culture and history. Successful students in this class are provided with the equivalent preparation required to advance to Spanish 11 in the following school year. This course looks at the general theory of Marketing and its role in our everyday lives. The Marketing mix is explored in detail after the students are exposed to some behavioural psychology and how it impacts our decision making processes. Practical experience is offered through a number of initiatives during the year. To better appreciate the role of customer service in marketing and business, students get practical experience through their Front of House work at the Bunch Theatre. The sales process is looked at in some detail and students are asked to enter the marketplace and sell advertising for the annual Brentwood Regatta Souvenir program. Students have the option of challenging the AP Music Theory exam in May. Students also have the option of registering for the Royal Conservatory Advanced theory exam which also occurs in May. This course will benefit all music students in all our group and private music tuition courses. It will especially benefit those students taking examinations in their instrument where theory is a co-requisite in order to receive their certificate. Offered as part of the Brentwood Arts progamme, Robotics will provide students with an introduction to the world of robotics using VEX Robotics technology. This is very much a ‘hands-on’ course, where they will learn most concepts through investigative activities. 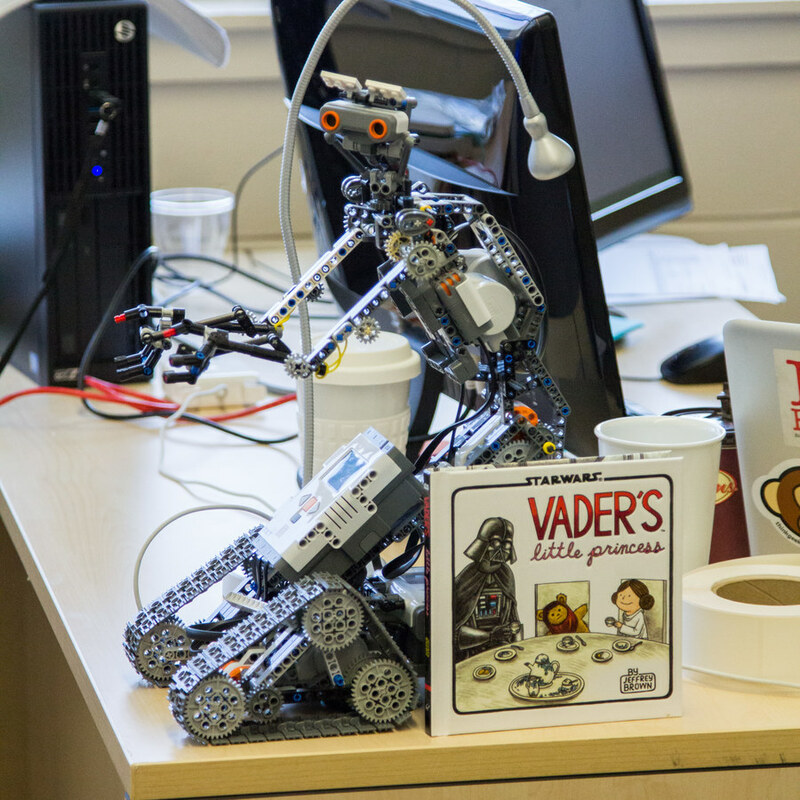 Students are exposed to the engineering process as they design, build, and program robots to solve a variety of problems. Good problem solving skills are essential, as is the ability to work effectively on a team. As a member of a 3-person ‘engineering firm’, students will develop skills in problem solving, communication, presentation, organization, time management, research, self-assessment, and leadership. This course will also expose students to some of the contemporary happenings in robotics, including current robot lab research and applications. In this course students will develop skills connected to assessing and analyzing design problems, and working alone or as part of a team to visualize, produce and critique solutions. Examples looked at in class will come from a broad range of fields, including: fashion design, architecture and interior design, environmental design, industrial design, product design, and visual art. Ideally, students will learn a little about all of these fields, but, more importantly, will learn to think like designers: researching needs, developing models, surveying clients, trouble-shooting productions and learning from challenges and successes. A thorough understanding of biology provides students with a foundation for studies in ecology, the environment and medicine. To fully comprehend the science of biology, students must first familiarize themselves with classification systems and evolutionary theories. The origin of life according to the heterotroph hypothesis is followed by a study of the Monerans emphasizing bacteria. Protists, plants and animals are then studied in a sequence that depicts the evolutionary progression of life. The oceanfront campus provides a unique opportunity for students to examine a living marine environment. This course represents the first year of the Advanced Placement Biology, a two-year course leading to the AP Biology exam, and that gives credit for both Biology 11 and Biology 12. A solid understanding of the additional material taught in this course may provide students with first-year biology credit in university. The first term focus is a study of biochemistry, cells and cellular processes. The animal kingdom and evolutionary themes are explored in the second term. The year concludes with a study of heredity including classical genetics, DNA, protein synthesis and the regulation of the genome. Several labs will be completed throughout the year including experiments related to the study of biotechnology and genetic engineering. This is a provincially prescribed curriculum designed for students who may not have taken Mandarin Chinese 5 to 10. Successful completion of this course should provide students with a level of competence that will allow them to successfully participate in Mandarin Chinese 11 and 12 courses. To provide students with an equivalent preparation for Mandarin Chinese 11 and 12 courses, this course incorporates material from the prescribed learning outcomes, suggested instructional strategies, suggested assessment strategies, and recommended learning resources identified for grades 5 to 10. A major aim of this course is to balance expectations regarding the emergent language skills of students who are new to the study of Mandarin Chinese with consideration of their ages, life experiences, and prior knowledge. It is expected that students will. As students acquire increasing variety in vocabulary and language structures, they are able to communicate about more topics. Assessment focuses on the communication of meaning and the extent to which students are able to share ideas and information. Although oral interaction is most important, students also need feedback and support in developing written skills.